Located to the east of North Capitol Street in the northeast quadrant of Washington, DC, Eckington is one of DC’s oldest neighborhoods. The area is undergoing a “mixed use” transformation, and is home to a mix of turn of the century row homes, newer condo developments and older industrial buildings. While residential properties are similar in appearance and architecture to those in higher-profile Bloomington, the prices are more affordable. 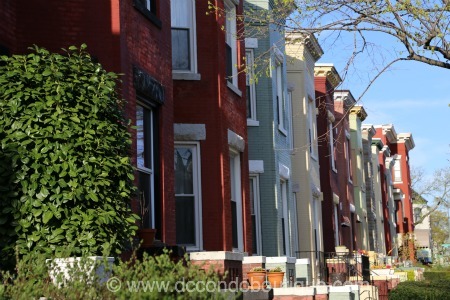 In fact, many DC residents are unaware that Eckington’s colorful row houses are the homes shown in the opening credits of the political drama, “House of Cards.” Other architectural styles include Federal structures with flat roofs, Victorian-influenced homes, and taller apartment buildings. South of Eckington is NoMA, one of DC’s newest neighborhoods which provides Metro access (New York Avenue/Florida Avenue) as well as a Harris Teeter and other retail options. Other notable landmarks close to Eckington include the Metropolitan Branch Trail, good for walking, biking and skating as well as the recently renovated Harry L. Thomas Recreation Center. Eckington is bounded by Rhode Island Avenue to the north, Florida Avenue to the south, the Metropolitan Branch Trail to the east and North Capitol Street to the west.